A LP with a really good hit box reach and that can be cancelled by a crouching LP. The punch normal attacks don’t change depending on the distance to the opponent, 1-button anti-air are possible (LP, HP). Based on the 2 above bullets, you can move forward and wait. A guarded crouching LP = opportunity for chip damage. The startup of the LP Super Zutsuki is slow and often, you won’t be able to use it as an anti-air. 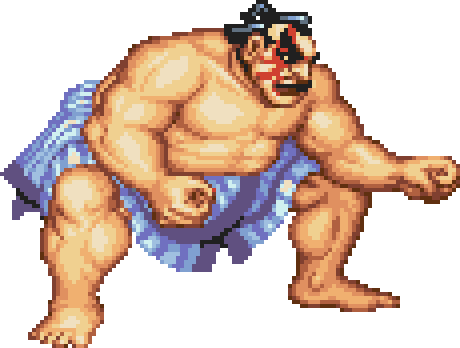 E. Honda’s throwing range is one of the best among all the characters of the game. Use this advantage by getting closer to the opponent and aiming for a throw loop. Show a gapless LP→ Hyakuretsu Harite game and see how the opponent reacts. Adapt your moves to this reaction. Wait for jumping attacks with a Super Zutsuki, a Super Hyakkan, a LP or a HP. Build your game mainly by combining the 3 patterns above, however, since patterns 2 and 3 depends on the opponent moves, use pattern 1 when you really are aiming for damages. Ideally, you would play a little with patterns 2 and 3 when starting but your finality will be to get into pattern 1. Create openings for the opponent to throw projectiles. Don’t be passive and just endure the projectiles, make your opponent throw the projectiles when you want. When you’ve detected particular situations when the opponent throws projectiles and are confident in this judgement, stick with it. To apply pattern 4, you can easily use MK, HK or crouching LP. For the pattern 5, be sure to base your judgement on situations created by one of your moves. Look for the reaction of your opponent for instance after guarding, after whiffing a LP on purpose or after evading the projectile with a neutral jump. For the pattern 6, you don’t have to attack every time. You can also jump forward to get closer to your opponent. In any case, as long as you get to be in the situation of pattern 1, you’re good. Since the crouching MK is a kind of universal anti-air, you shouldn’t be too much disturbed by jump in attacks. Use the Hyakuretsu Harite as a pivot of your game and apply the pattern 2. When dealing with the Air Slasher, the ideal is to hit with a jumping MK while rising. Once you’ve been put a a distance, there is not much you can do against the projectile game of your opponent.Try to block your opponent game plan with a neutral jump escape or a back escape (as described in the next section). Unlike against other characters, you won’t get into a particularly good position by neutral jumping LP sonic booms. With the LP sonic boom, the opponent has a setup of walking forward and aiming for a trade with a HK so try to make the opponent use the HP sonic boom instead. Forcefully jump in on HP sonic booms and aim for a win by trading damage advantageously. If you manage to grab your opponent, continue with a HK grab → jumping LK → close LK → HK grab loop until the border of the stage. Valid not only for the S version of E. Honda, the hurt box of E. Honda while empty jumping is especially small. While used correctly, it can often make normal anti-air, Scarlet Terror, Jackknife or Tenshou Kyaku whiff. On Shouryukens, it might allow you to get only partially hit. Generally, only slow LP projectiles can be neutral jump escape on reaction. The purpose of using this move against projectiles is to make the opponent use faster HP projectiles. That would allow you to get closer to your opponent by using the “back escape” strategy below. Against fast HP projectiles, jump forward while trying to have a timing that makes you land with the projectile just passing your back. It should make you land before your opponent gets a chance to anti-air and it gives you the initiative for the next move. When you MP throw your opponent towards one end of the stage, if the opponent tech throws and touches the border of the screen at the apex of its trajectory in the air, the game freezes. Therefore, MP throws towards stage borders is forbidden. If the game freezes, it actually recovers after about 13 minutes.